Benjamin Rampton with a nice 11 lb fish caught on 22nd September at Bluestone on the Whiteadder. 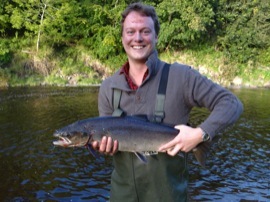 This entry was posted in Uncategorized and tagged Angling, Bluestone, fishing, FishTweed, River Tweed, season 2012, spring salmon, Tweed, Tweed Valley. Bookmark the permalink.